Shiny Solrock in game: 38 Who? Important notice! Pokemon Shiny Solrock is a fictional character of humans. Solrock (Japanese: ソルロック Solrock) is a dual-type Rock/Psychic Pokémon introduced in Generation III. It is not known to evolve into or from any other Pokémon, but it is considered to be a counterpart of Lunatone. 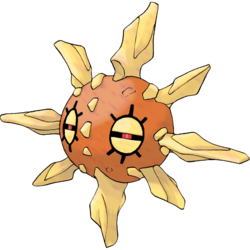 Solrock is a primarily orange, spherical Pokémon. It has eight yellow, rocky spines extending from the sides of its body, and multiple small, yellow stony bumps running vertically along its center. On its back are dual rocky mounds, situated to the sides of the midline. Its large eyes consist of thick, semicircular yellow eyelids through which black sclera and red pupils can be seen. A black ring with six extensions surrounds each eye. Solrock relies on solar energy, which it absorbs in groups during daylight. While it is always expressionless, it is able to sense the emotions and thoughts of others. It spins its body to produce intense heat and a blinding light. It is able to stay silent while floating in the air, and can be found in caves. A Solrock appeared under the ownership of Tate in It's Still Rocket Roll to Me! and Solid as a Solrock. 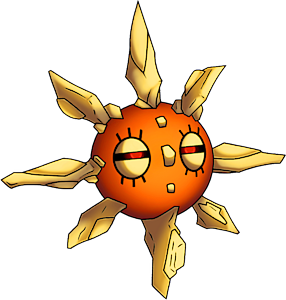 Solrock first appeared in the main series in Take the Lombre Home. A group of people blamed a wild Solrock for a drought in their village, when it was actually Team Rocket stealing their water. The Solrock redeemed its reputation when it helped to get rid of Team Rocket. Brandon used his Solrock in a battle against Ash in Pace - The Final Frontier!. A Solrock appeared in Hoopa and the Clash of Ages under the ownership of Baraz. A Solrock appeared in A Performance Pop Quiz!, under the ownership of Lily participating in the Anistar City Pokémon Showcase. It appeared again in A Dancing Debut! during the Couriway Town Pokémon Showcase. 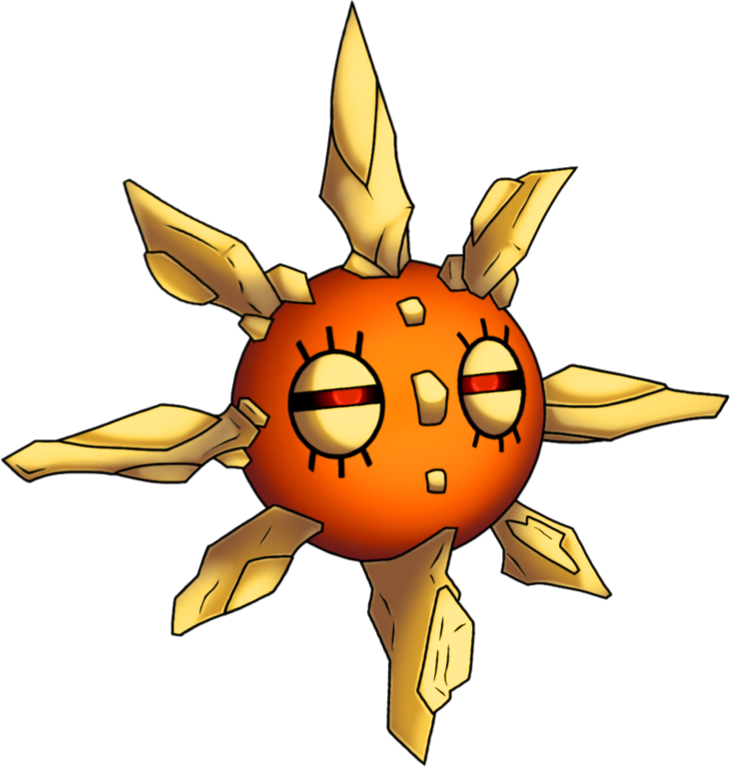 A Solrock belonging to a Coordinator appeared in Dawn's Early Night!. It was used along with a Lunatone for the Double Performance required during the HearthomeContest. 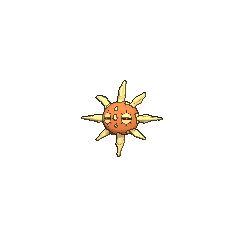 An engraving of a Solrock appeared in Bucking the Treasure Trend!. A Solrock appeared in the opening scenes of Zoroark: Master of Illusions. AG063 Solrock Ash's Pokédex Solrock, the Meteorite Pokémon. Solrock has the ability to read its opponent's minds. It attacks by rotating quickly while giving off and intense heat. AG190 Solrock May's Pokédex Solrock, the Meteorite Pokémon. Sunlight is the only source of Solrock's power. It can float silently through the air. A Solrock appeared during a flashback in The Redemption as one of the many Pokémon fighting in the great war of Kalos, 3000 years previously. In Pokémon Adventures, Solrock first appears in I'm Always Grumpig First Thing in the Morning II, owned by Tate. 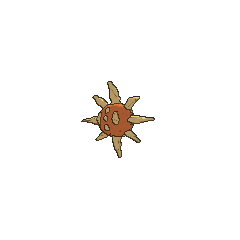 A Solrock appeared in Death Match Between Summer And Winter!. Pokémon Adventures PS228 The sunlight is its source of energy. It is said to be able to read the opponents mind. It gives off heat by spinning its body. Pokémon Trozei! 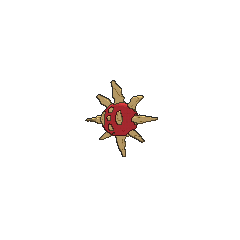 : Solrock is the symbol of the Secret Operation League. Sunlight is the source of Solrock’s power. It is said to possess the ability to read the emotions of others. This Pokémon gives off intense heat while rotating its body. Moves marked with a superscript game abbreviation can only be bred onto Solrock in that game. 51%-100% HP Let me marshal the power of the sun for massive attacks! Level up Leveled up! Sunshine's power intensified! Solrock seemingly wobbles in midair. Its whole body flashes to impede capture. 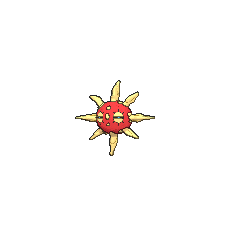 For other sprites and images, please see Solrock images on the Bulbagarden Archives. Solrock shares its category with its counterpart Lunatone. They are both known as the Meteorite Pokémon. Solrock is based on the sun, as well as a meteorite. Solrock is a combination of sol (Latin for sun) and rock. Mandarin Chinese 太陽岩 / 太阳岩 Tàiyángyán Literally "Sun rock"